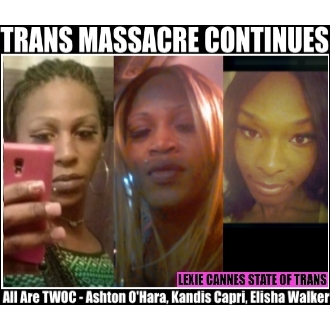 LEXIE CANNES STATE OF TRANS — In Johnson County, North Carolina, the body of missing trans woman Elisha Walker (aka Angel Elisha Walker) of Salisbury, NC was found in a crude grave last week. According to reports by blogger Monica Roberts and The Guardian, Walker’s body was found after police, armed with a search warrant, inspected the woods behind a house. Police arrested Angel Dejesus Arias and charged him with murder. Walker was reported missing on Nov. 11, 2014. After police found her burnt-out car, the investigation eventually lead to the burial site 100 miles from the victim’s home. In Phoenix, Arizona, trans woman Kandis Capri shot outside an apartment complex last week and was pronounced dead upon arrival at a hospital. Details are few and police have not responded to media inquiries. One source has the victim’s mother stating that Capri was shot 3 or 4 times and that the results of an autopsy would be soon revealed to her. The victim’s mother, Andria Gaines, is using male pronouns in reference to victim, but acknowledges that Kandis identified as transgender. In Detroit, Michigan, news surfaces of a second recent transgender death in the city (Amber Monroe was reported murdered earlier). Equality Michigan is reporting Ashton O’Hara, who identified as transgender, but used male pronouns, was brutally murdered in a field last month. A suspect, Larry B. Gaulding, was charged with first degree murder and scheduled for trial in September. Yup, the elephant in the room — all trans women of color.